Apparently it has multiple volumes in there, similar to what's available in Japan for Berserk. I rarely saw this, but.... ew. Still paperback? I don't read Vagabond but it would be nice if it was Hard cover. I still hope maybe they do something like this for Berserk in America 3 volumes in one hardcover with nicer paper, maybe the covers of the 3 volumes assuming they don't use one for the cover in the back. One can dream. Oops offtopic, still its not worth it. Yeah, I think it's pretty cool, honestly. Especially for new readers. The page quality is sure to suffer though, in my experience of these large editions. Looks good if you don't already have them, and you're basically getting Vagabond at a third of the price, so it's certainly a good value. For being called the BIG edition though, I'd want the dimensions to be larger akin to those supersized Berserk releases. Speaking of, the most exciting thing in this thread is the idea of a Berserk version of this, which I'd definitely welcome. It's no the concept I dislike.. It's that cover. Sorry, but it could be much better! I'm going to be recommending it to friends who want to get into it without paying out the nose. It could be a LOT worse, dude. You should see the Berserk supersized covers. My god, it even has an iPod ad on it. Yeah, I saw them in real life recently and was NOT impressed. I supposed I've been spoiled by Viz with Vagabond. Either way I'm not purchasing it, but I'm still going to keep reservations about the design. It's not the same thing, though. The MBRs were sold like magazines, not books, and they were cheaper as well. It was also a temporary deal, and I don't think you can find them at retail anymore. That's why the covers were drowned in text and ads, just like YA's covers always are (not that I can complain about those iPod ads myself anyway ). If Berserk were to get a real "premium edition" I'd expect something a lot classier. San Francisco, CA, January 3, 2008 — VIZ Media, LLC (VIZ Media), one of the entertainment industry's most innovative and comprehensive publishing, animation and licensing companies, brings a new perspective to the manga marketplace with the launch of a new imprint called VIZBIG Edition. The new imprint will release omnibus editions of top-selling manga series in a larger 5-3/4 x 8-5/8 size (larger than the standard 5 x 7-1/2 manga) with special premium presentations including new cover art. RUROUNI KENSHIN will be the first series to receive the VIZBIG Edition treatment this month, with DRAGON BALL and DRAGON BALL Z set for May release and Takehiko Inoue's VAGABOND will follow in Fall of 2008. These VIZBIG Edition titles have an anticipated initial cover price of $17.99 and will be released quarterly. Several other titles are also presently being considered for future VIZBIG Edition publication. Each debut VIZBIG Edition will contain the first three volumes of the original graphic novel series presented with larger trim size, bonus color pages and added content such as author interviews, updated text and character art. The new editions serve as ideal comprehensive introductions for new readers to some of manga’s best-known titles, and a great way for seasoned fans to see their favorite titles in a new perspective. Prices might be higher than what Amazon.com lists. Now that's what I'm talking about, those kinds of upgrades definitely make it worth checking out... and makes me wish for Berserk to receive this kind of treatment all the more. It's only a matter of time until it does. Maybe they're waiting for the series to be closer to its end. Damn it! I just ordered the first 8 vol. 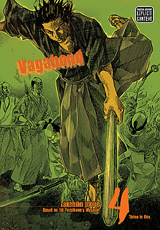 So, I was told that the first volume of Vagabond VizBig had already been released. Does anyone have it?, how does it compare with the original release? the same number of color pages as the original release? or some pages are grey-scale like other VizBig releases?...original covers at the end of the book like the Kenshin edition or anything? I checked out volume 2 of VIZBIG Vagabond tonight at Borders and found it quite impressive. Still, I don't know that I'd want to read it that way, with such thick volumes. It's also disappointing that they don't carry anything but the VIZBIG versions when so little of the series is covered through that format thus far, and even the newest volumes are absent. My issue with the VIZBIG editions are that Inoue planned his volumes out so that on most occasions, the story reaches some kind of climax by the end of each volume. This is evident even up to the current releases. So it seems that Inoue was very conscious of the way his volumes would be read and digested by the readers. Cramming three into one issue just seems to be violating that planning, to me. Just an example to prove illustrate my perspective: At the end of vol 13 (disregarding the flashback stuff with Tsujikaze Kohei), there's a really brilliant and haunting allusion to Kojiro, and for me that suspense was only built further because of the distance between the releases of volumes 13-14. Had Viz planned the VIZBIG editions to span that far, wouldn't they put these two volumes within pages of each other? That's true, 13, 14, and 15 would be packed together at this rate, and even more awkward for those in the know, 19, 20, and 21. I totally share that sentiment, it was great as originally presented, though there is that one mitigating factor, the Kohei min-arc. If you can disregard that, and really, it's not easy considering some it's own haunting allusions, I think you can get past the Kojiro arc starting in the same book. Still, there's no arguing the way to go is the volumes. My biggest complaint with Vagabig is similar, but simpler... it's just too big. The size of the regular volumes is most comfortable for reading. Well then, there you have it. The VIZBIG editions are good for attracting newer readers, but really don't serve much of a purpose to the series collector, once they're sold on the series. Looking at my bookshelf and seeing my my Vagabonds lined up so neatly -- they really are one of my most cherished collections. Interesting that they're up to volume 4 of VagaBig, so I'm assuming all the way to volume 12. I wonder how far they're going to take this format. So that covers vols 10-11-12 and THAT'S the image they chose? Hahaha, I didn't think of that, but yeah, apparently it was the best they could come up with. Disappointing even compared to their previous VagaBIG efforts. Back in Jan 2011, I picked up volumes 1 through 9 as a gift for a close friend's birthday. He'd loved the series when I lent my regular Viz volumes. I guess it was a convenient way to get my friend something tangible and cost effective to carry forward since he's conscious about the latter. Didn't realize it at first (because at the store you only see the volumes on the wall, scattered about with the cover facing you) but when I visited my pal later on I noticed - if you put all volumes next to each other, each volume has a different character on it's spine and it forms 1 flowing remarkable image. Seeing as hard it has been for me personally to find older issues of Morning, I'm on a bend whether or not I should buy these because of the page size. I often read Vagabond on the subway, easier to carry/ handle/ use in retrospect. Fiddling around with a brush, ink and Japanese paper gets me excited whenever I see a bigger format for Vagabond's beautiful panels/ brush strokes. I agree those covers are plain bad in comparison.